Here are the hummus and pita recipes, as well as some other things you may consider making. Note: I sometimes prefer to bake these so I can avoid the deep frying. I bake them on a nonstick pad (silpat or the like) at 325F (160C), just until they’re firm, about 20 minutes. 2. If you wish to soften the peel, soak the lemons in lukewarm water for 3 days, changing the water daily. 3. Quarter the lemons from the top to within 1/2 inch of the bottom, sprinkle salt on the exposed flesh, then reshape the fruit. 4. Place 1 tablespoon salt on the bottom of the mason jar. Pack in the lemons and push them down, adding more salt, and the optional spices between layers. Press the lemons down to release their juices and to make room for the remaining lemons. (If the juice released from the squashed fruit does not cover them, add freshly squeezed lemon juice — not chemically produced lemon juice and not water. *) Leave some air space before sealing the jar. 5. Let the lemons ripen in a warm place, shaking the jar each day to distribute the salt and juice. Let ripen for 30 days. 6. To use, rinse the lemons, as needed, under running water, removing and discarding the pulp, if desired — and there is no need to refrigerate after opening. Preserved lemons will keep up to a year, and the pickling juice can be used two or three times over the course of a year. Notes from Epicurious:According to the late Michael Field, the best way to extract the maximum amount of juice from a lemon is to boil it in water for 2 or 3 minutes and allow it to cool before squeezing. Notes from Paula Wolfert:• Located on Morocco's Atlantic coast, south of Casablanca and north of Essaouira, the city of Safi is known for its seafood specialties.• To most closely approximate the flavor of Moroccan lemons, Wolfert recommends Meyer lemons for this recipe. This lemon/mandarin orange hybrid, in season in January and February, has yellow-orange flesh, a smooth rind, and a sweeter flavor than other lemons. • To sterilize a mason jar for the lemons, place it upside down in a steamer and steam for 10 minutes. Using tongs (wrap the ends in rubber bands for a better grip), remove the hot jar and dry it upside down on a paper towel-lined baking sheet in a warm oven. To sterilize the jar's top, boil it in water for 5 minutes, then remove with tongs. When you're ready to use a lemon, remove it with clean utensils to avoid contaminating the inside of the jar with bacteria. This way, the remaining contents of the jar will not need to be refrigerated. Here are two really tasty dips! One is called Dukkah and it's a dry mixture of nuts, seeds and spices. 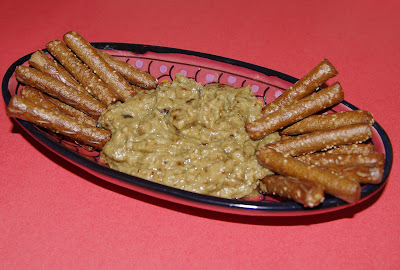 The other recipe is a Roasted Pepper and Walnut Paste Dip. 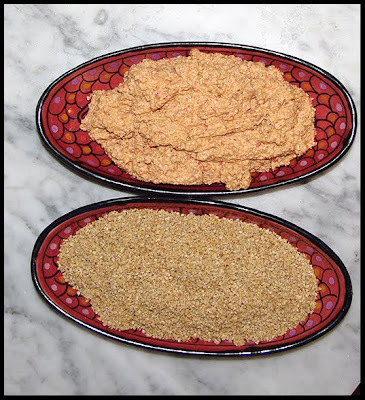 Both recipes are from Claudia Roden's book, The New Book of Middle Eastern Food. Put each variety of seeds and nuts on a separate tray and roast them all in a preheated 350F oven for 10-20 minutes, until they just begin to color and give off a slight aroma. As they take different times, you must keep an eye on them so that they do not become too brown, and take each out as it is ready. You could also roast them in a frying pan. Put them together in the food processor with salt and pepper and grind them until they are finely crushed, but be careful not to over-blend them into a paste. To serve, pour a little oil on small slices of bread and sprinkle with the Dukkah. Roast the peppers by turning them under the broiler or in the hottest oven until their skins blacken and blister, then skin them and remove the seeds. Blend the peppers to a paste in the food processor, add the rest of the ingredients, and blend very briefly. 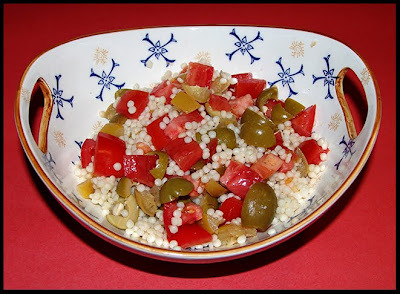 A simple couscous salad--couscous, chopped green olives, feta cheese, diced tomatoes, and diced preserved lemons dressed with just a bit of olive oil and sea salt. I used the larger Israeli couscous, but the regular kind would work just as well. 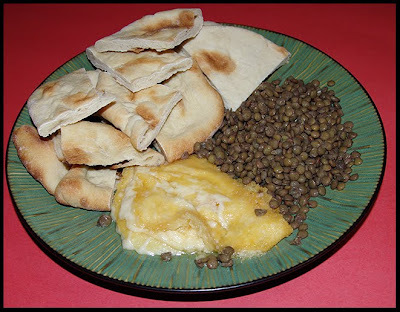 Fried Kasseri Cheese and Lentils dressed with olive oil and the juice from preserved lemons. To fry the cheese, coat 1/3" slices of Halloumi or Kasseri cheese is flour and pan fry until golden on both sides. You can also just melt the cheese under the broiler--omit the flour. To serve, drizzle some fresh lemon juice over the cheese while still warm. 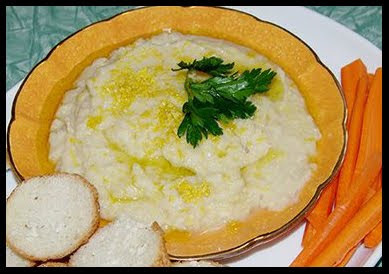 Baba Ghanoush--a fantastic dip made from roasted eggplant. It comes out silky smooth but just so full of flavor. It's sometimes called eggplant caviar. Here's another chickpea recipe that's very similar to hummus, but more of a fondue since it's served warm. Note: I had a bit of trouble getting these to stay together during frying, so I ended up baking them at 350F until they were lightly browned. Rinse the peas in a sieve under running water, then place in a large saucepan. Add water and bring to a boil. Once boiled, add the onion and simmer over low heat for 50 minutes, until thick. Remove from heat and set aside to cool. Add the parsley, breadcrumbs. cheese, eggs, salt and pepper, and mix together to form a thick consistency. Knead the mixture and shape into golf ball-sized balls. 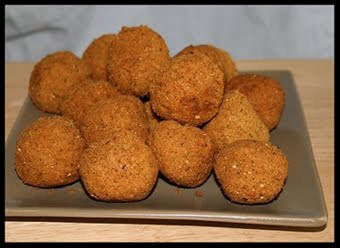 Coat each ball in flour and fry in olive oil until golden. I based this recipe on Mark Bittman's tortillita recipe. Tortillitas are a Spanish chickpea flour pancake, but I switched up the ingredients a bit. In a bowl, combine flours, baking powder and salt and pepper. Add a little more than a cup of water and stir to combine; it should look like pancake batter. Stir in the onions, peppers, and herbs. Put a large non-stick skillet over medium-high heat and film its bottom generously with olive oil. When the oil is hot, pour in about 1/3 cup of the batter per pancake. Cook for about 3 minutes, or until pancakes are set around edges. Flip, and cook for another 30 seconds or so, until lightly browned. Keep making pancakes until the batter is all used up. 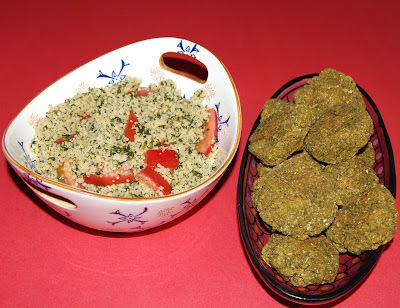 Tabouli and falafels that I baked instead of fried. 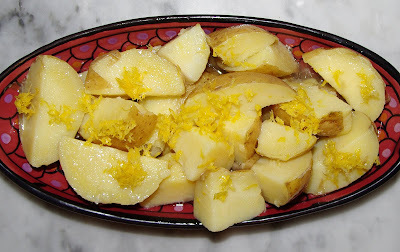 Steamed potatoes dressed with a little olive oil, sea salt, lemon juice, and lemon zest. 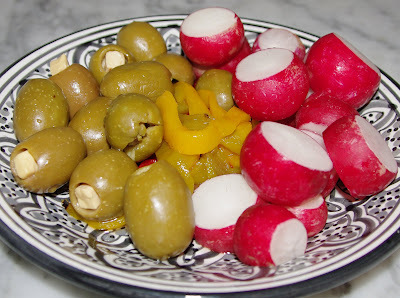 Some olives stuffed with feta cheese, roasted peppers, and radishes. 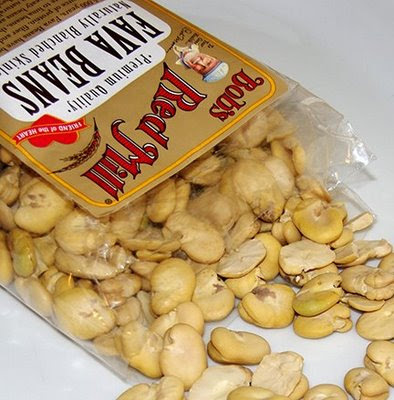 Here is a recipe for mashed fava beans--it's sort of an alternative to chickpea hummus. Fava beans, fresh and dried. 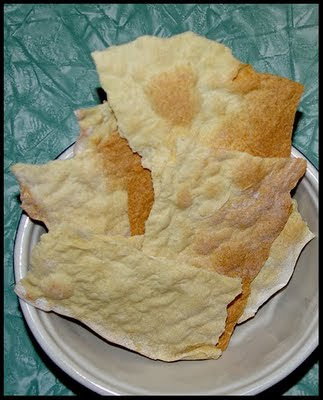 Here's a recipe for a very thin cracker bread called lavash. It's easy to make and would be great for dips. Homemade pita is so much better than anything you can get in the store, but if you do end up with some leftovers, here are two recipes to help you use up that pita. Fattoush is a salad made with pita, lettuce, cucumbers, tomatoes, and cucumbers--it's completely delicious. 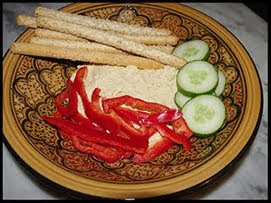 And of course, there's always pita chips--so much tastier (and healthier) than fried snacks. • Here is an online Middle Eastern grocery store that sells spices and other neat products, plus they have a bunch of great recipes. • Here is the Wikipedia entry on mezze. 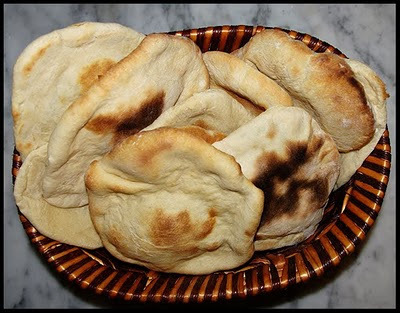 • Here is a video that shows how to make the pita bread. Notice the awesome music! 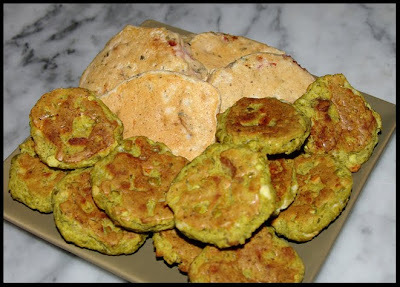 • Here is a video on falafel making. 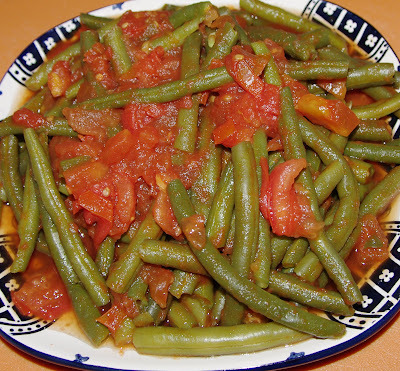 • Here is a Middle Eastern Cuisine link on mezze including recipes for all diets. • Gourmet magazine has a recipe for Quick Preserved Lemons. 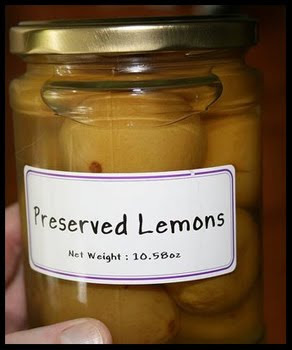 • Here’s a video on making preserved lemons. Wow! 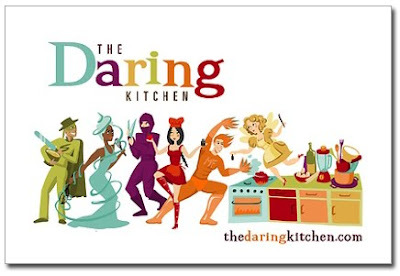 Fantastic challenge and you have so many great recipes here! I absolutely love Claudia Roden's book and cook so much out of it. Thanks for a wonderful challenge, we can't wait to cook up an absolute feast!!! WOW you have put so much work into this challenge it is amazing. I think I like split pea rissoles and the tabouli well done. Cheers from Audx. My kind of eats. My kids like this type of eating. I sometimes call it rainbow night and have different colors represented. I love Claudia Roden's book too. Ciao ! Super challenge ! Thanks for choosing so many different things ! What a wonderful collection of recipes...my mezze table is going to be overflowing! You've given us a great palate of flavors and ideas to play with. Thanks for a great challenge! Waiting until the last minute for this challenge, as usual... but looking forward to it! Can't beat a weekend-day of little plates, after all. Thank you all so much! I can't wait to see what you make! Well, it's over a year later, but I'm so glad I found your blog. has aided me out loads. I'm hoping to give a contribution & help other users like its aided me. Great job. What's up, I read your blog daily. Your humoristic style is awesome, keep it up! I don't understand why I am unable to subscribe to it. Is there anybody having the same RSS issues? Anybody who knows the answer can you kindly respond? Thanks! !